If we had to elaborate on what potatoes are, then these come under root vegetables that belong to the family, Solanum tuberosum. It’s nothing but a small plant with large leaves. Most of the times, the part of the potato that people eat is tuber. Such a kind of portion grows below the ground level. As far as the constituents are concerned, these vegetables contain starch and carbohydrates. They are light brown in color with a yellowish skin. In case the potato is exposed to light, the tuber starts becoming blue in color and makes the vegetable unhealthy. Basically, potatoes come under two different categories, starchy and waxy. You can also think about a category in between the ones mentioned above. 2.1 Is potato good for you? 2.2 What can you expect from potato skin nutrition? 2.3 What is the weight of protein in potatoes? 2.4 How many calories are there in a potato? 2.4.1 Was this article helpful? It has been observed that there are 200 different varieties of potatoes found in the United States. Depending on the texture and ingredient functionality, they are classified into different categories. So, let’s dive deep into the different types. As the name implies, starchy potatoes are always high in starch. The varieties include Idahos, yams, Russets, and sweet potato. Due to less moisture content, these vegetables are the most suitable ones for baking, mashing, boiling, and frying. An individual couldn’t determine the shape because the potato flakes easily separate soon after cooking. If you are thinking about the health benefits, then starchy potatoes can help in resolving bowel irregularities and problems pertaining to digestion. With other ingredients like cucumber, a person can also use the starch for preparing a face mask. If you consider 1 tablespoon of mashed starchy potatoes, then the calorie intake is as much as 40 calories. The person can expect around 10 grams of carbohydrates with little dietary fiber. The figures are a little more when compared to cornstarch. As compared to starchy potatoes, waxy potatoes are low in starch, but contain high amount of sugar and moisture. These are generally smaller and spherical in shape due to a thin skin and smooth texture. Red bliss or French fingerling are the most common varieties of waxy potatoes. Since these retain the shape even after they have been cooked, these are can be included in salads or gratins. Waxy or new potatoes contain less starch and often have a moist as well as creamy flesh. While the calories of new potatoes are around 100 calories, these have Vitamin C and potassium in significant amounts. Popularly known as Yukon Golds, the all-purpose potatoes are less starchy and are far more capable to retain the shape. But, these are very much fluffy and absorbent, thus making them ideal for a potato dish. You can always use them in a different kind of recipe once they are mashed well. Known as Idaho potatoes, Russets are relatively larger in size, and have a brown skin. In our opinions, these are best for mashing, frying and baking. Chunks fall apart easily once these are boiled for some time and are fluffy. These tubers could be served as a part of a dessert because of the sweetness. Basically, these come under two types – oblong shaped potatoes and boniato. While the first type has a reddish-brown skin and a sweet orange flesh, the other type has a dry flesh and a light tan skin. Both the types can be roasted, baked, steamed, mashed, boiled, or pureed. You can also use them for making noodles. If you take care of removing the dry skin, then you can roast them for a delicious and lip-smacking treat. Additionally, they help to enhance health because they are fibrous and are packed with loads of nutrients. Yams, on the other hand, are less sweeter than sweet potatoes. The flesh may sport different color shades, ranging from milky white to dark red. In case you can’t source sweet potatoes at the market, then yams could be considered for recipes. These round, thin-skinned potatoes bear a waxy flesh that can be cooked. While these are suitable for crispy roasted potatoes, they can be boiled for stews and soups. One red potato which weighs 5.2 ounces has 110 calories and is a rich source of potassium and Vitamin C. Apart from other nutrients, these are known to be a good source of Vitamin B6, and are free of fat, cholesterol and sodium. It’s never a good idea to eat raw potatoes. But, in case you are going to smash or boil them for the side dish you have been thinking about, then let’s look at the nutritional facts. The mashed potatoes nutrition fact sheet states almost 200 calories, 4 grams of protein, 35 grams of carbohydrates, and 12.5 milligrams of Vitamin C. On the other hand, one medium sized baked potato has just 110 calories and zero percent fat as well as cholesterol. It can also furnish the body with half amount of required Vitamin C.
In case you would have to consider a large boiled potato, then it has 261 calories, 3 grams of fat with the skin left as it is. But, if you peel off the skin, then there’s no difference in the calorie and only half gram of protein is retained. Boasting a round or oblong shape, white potatoes have a thin skin and is waxy in texture. The variants are broadly classified under those of White Rose and Finnish yellow. Since they can be used for different purposes, they can be boiled, sautéed or steamed. Yukon Gold is yet another variety that has a tender pale yellow skin. They are much expensive because of the creamy gold flesh and a butter like flavor. So, if you are thinking about a nutty taste, then you should add them to mashed cauliflower potatoes. As far as white potato nutrition is concerned, then a small potato has 17 milligrams of Vitamin C as well as 52 milligrams of folate. While the dietary fibers are as much as 2.9 grams, 751 milligrams is the weight of potassium present in the potatoes. Besides, these are fat-free and helpful to reduce the risks of hart strokes owing to 10 milligrams of sodium. As it means through the name, purple potatoes have a dark purple colored skin and a starchy flesh along with a slight nutty flavor. Extra antioxidants from anthocyanins is what makes this type unique. So, when you are think about following a balance diet, you should add these to boost the dose of health benefits. You can always be amazed with incredible health benefits of eating purple potatoes. But, the only thing that distinguishes purple potatoes from white potatoes is the antioxidant content. The purple ones contain four times more antioxidants than white ones. Moreover, the calorie intake is 52 calories, carbohydrates are 12 grams, protein content is 1.4 grams, and Vitamin C is present as less as 6.5 milligrams. But, comparatively, potassium constitutes 341 milligrams. Magnesium is also present in significant amounts because it is 16.5 milligrams in weight. Whenever you come across all purpose potatoes, these contain zero grams of fat and cholesterol. While the sodium content is 5 mg, potassium is as much as 680 mg. These can contribute to the overall development of the body due to 3 grams of protein and 2 grams of fiber. The findings are based on 1 medium size potato weighing 148 grams. When it comes to sweet potatoes nutrition, the calorie intake is 100 grams, and the carbohydrates and proteins are 23.6 grams and 2.3 grams respectively. As far as the vitamins are concerned, Vitamin C is as much as 22.3 milligrams while manganese is up to 0.6 milligrams. The weights are found with 100 grams taken into consideration. Is potato good for you? Plain baked potato is always considered as a healthy foodstuff. Apart from offering Vitamin B6, Vitamin C and iron, the vegetables are supposed to be rich in potassium, starch and fiber. The antioxidants promote cardiovascular health and keep the person fit all year round. What can you expect from potato skin nutrition? A potato skin is rich in nutrients but, eating a whole potato can help owing to fiber, iron, Vitamin B-6 and Vitamin C.
As for the carbs in potatoes, these are 17 grams when a serving of 100 grams in considered. What is the weight of protein in potatoes? For 100 grams of the vegetable, the individual is sure to stay healthy with 2 grams of protein. How many calories are there in a potato? The calorie intake is 77 calories when a serving of 100 grams is considered. 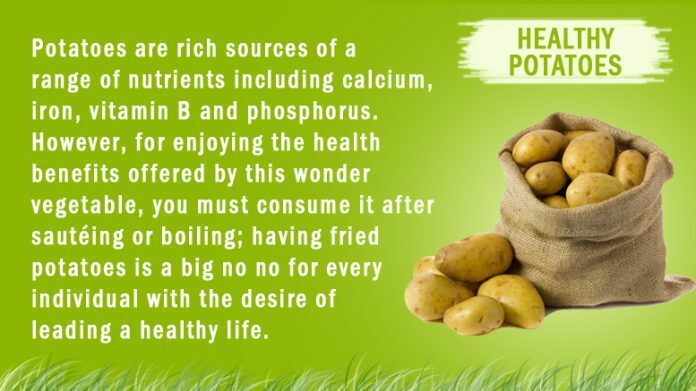 So, now that you are aware of the nutritional value of potatoes, think about preparing a dish for lunch or dinner.